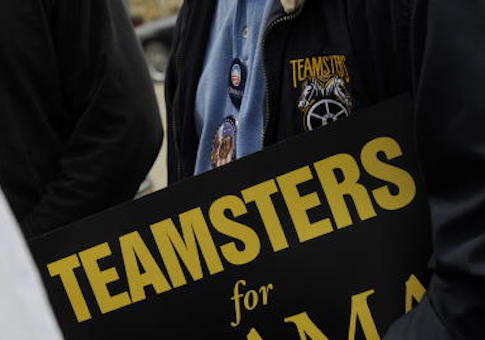 The Pennsylvania Teamsters scolded its members for helping President Donald Trump capture the White House in 2016 and warned of dire consequences if they break from the union slate in 2018. Union leadership sent out a newsletter to members in September calling on them to stick to the labor organization's preferred slate of candidates in order to avoid doomsday. The legislative action alert led off with a photoshopped mushroom cloud warning of the "Total Annihilation Of Unions." "Face it, we screwed up by not voting or voting the wrong way," the alert said. "Union members in the 2018 elections must support candidates who pledge to protect unions, your collective bargaining agreement, your pension and the working men and women, and who also commit to working across partisan lines to produce practical approaches to the challenges facing the country." The newsletter pointed to the Supreme Court's June Janus decision, which overturned decades-old precedent allowing public-sector unions to collect fair share agency fees from nonmembers. It also warned of the spread of right-to-work laws in traditional labor strongholds. "We are stuck with an anti-union court and Congress. Failure to correct the course we are on will result in the total annihilation of unions and the loss of your collective bargaining agreement that provides you with good wages and benefits down the road," the letter said. The Teamsters council did not return request for comment. Union members were a key voting bloc for Trump in 2016, helping him become the first Republican nominee to win Pennsylvania in decades. Their votes flew in the face of near universal opposition from official union endorsements. The surprising result led AFL-CIO state president Rick Bloomingdale to say that union leaders "may have gotten too close to one party" after embarking on a listening tour. The state AFL-CIO has endorsed mostly Democrats in the midterms, but has also thrown its support behind GOP representative Brian Fitzpatrick. Bloomingdale defended the newsletter in a phone interview with the Washington Free Beacon, saying the Teamsters, who fall under the AFL-CIO umbrella, are free to endorse any slate of candidates it chooses. He said the newsletter was "issue-specific" and focused on regulatory and judicial matters rather than Trump as a whole. The union leadership "are doing what every group does, which is to tell their people to vote for the issues we support," Bloomingdale said of the newsletter. "They weren't demeaning their members at all…. They're blaming themselves as much as anybody else." He also emphasized that members are not bound to union endorsements and can base their vote on whatever issues they choose. The message, he said, focuses solely on union priorities, a fact that "our members are smart enough" to understand. "We never try to tell people or enforce upon people how they should vote," Bloomingdale said. "They'll get their information about [candidate positions on] guns or church from the other organizations they belong to.… All members are asking from us is who supports us on union rights." Patrick Semmens, spokesman for the National Right to Work Foundation, said union endorsements matter, especially in an election year when tens of thousands of dollars are spent to support candidates. The Teamsters PAC has spent more than $300,000 on candidate donations in the Pennsylvania midterms, with nearly all of that money going to Democrats. Fitzpatrick received a $5,000 in the Republican primary, according to FEC documents. Semmens said the behavior of the national union and the message from the state council highlight the disconnect between leaders and its members. "Instead of representing the diverse political views of union members, union officials' response is to lecture and bully workers into voting only for the candidates who will expand union boss power," Semmens said. "This attitude is exactly why so many workers view labor officials, especially those in state capitals and in multimillion-dollar headquarter buildings in Washington, D.C., as completely out of touch with the interests of those they claim to represent." Trump has continued outreach efforts to blue collar and union workers in swing states. President Trump visited the National Electrical Contractors Association convention in Philadelphia on Oct. 2. He touted the newly released United States-Mexico-Canada Agreement, his regulatory agenda, tax cuts, and focus on manufacturing to the crowd of union workers who applauded. "We are finally rebuilding our country, and we are doing it with American aluminum, American steel, and with our great electrical contractors," he said. "America's economic revival would not be possible without the men and women in this room." Wally Zimolong, an attorney who has filed suit against several labor organizations in the state, said the "vote your paycheck" mantra could backfire at a time of economic prosperity and consistently low unemployment rates. "Union employment is at a record high because of the president's policies," he said. "Members are quite happy with full employment and their paychecks that often include overtime payments." Bloomingdale said he expects the midterms to be as much about local issues. This entry was posted in Politics and tagged 2018 Election, AFL-CIO, Pennsylvania, Teamsters. Bookmark the permalink.